Contemporary Romanian Cinema: The History of an Unexpected Miracle. 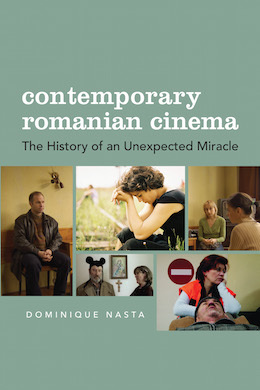 With her latest book Contemporary Romanian Cinema: The History of an Unexpected Miracle, Dominique Nasta joins a circle of prominent thinkers from Yvette Bíró to Dina Iordanova in the serious study of Eastern European cinema. Nasta’s Romanian background, acknowledged in the preface, is the driving force behind her research and provides her with an intimate understanding of her topic. Her book is more than just a history of the unexpected miracle of Romanian cinema, but acts as an encyclopedia of sorts that examines a cinema long overlooked. From the beginning, Nasta places the cinema of Romania in a tradition of metaphoric representations. Starting with the Romanian folkloric tale, Mioritza, the author establishes Romania’s cultural identity via its rich history of allegorical storytelling that featured “black humour, spontaneity and ironic wit” (5) later distinguished as the Theatre of the Absurd through the works of renowned Romanian playwrights I.L Caragiale and Eugène Ionesco. Alongside Nasta’s extensive insight into the oeuvre of Romanian auteurs, writers and thinkers, is her attention to actors and cinematographers. The first few chapters of the book take the reader on a brief journey through Romania’s history, closely analysing the restrictions faced by the film industry and the pressure of political propaganda. Only classical adaptations were permitted in the early days of communist leader Nicolae Ceausescu’s reign. There were no new voices or opportunities to progress beyond convention, only “proto-revolutionary” (20) themes were given the green light. Nasta explains how the oppression only intensified after Ceausescu’s trip to North Korea, forcing filmmakers to assume a more somber tone in their films, further compromising their creative processes. Throughout the book, Romania’s problematic identity is illustrated through its chaotic past, in an attempt to map out the origins of the critically coined ‘Romanian New Wave’ and to explore why its arrival at Cannes was so delayed compared to other international nouvelles vagues. It is in the fifth chapter that Nasta provides case studies of specific filmmakers. She appropriately examines Dan Pița and Mircea Daneliuc, dissecting each of their approaches and arguing that they share a key characteristic of embodying subtle metaphoric references to the dystopian environment. Alternatively, and acting as an intermission from the main direction of the text, chapter six is slotted in at an important part of the book, detailing the events leading to the Romanian Revolution of 1989 that initiated the collapse of communism. It is difficult to understand the films of the time, and even the films of New Romanian Cinema, without an understanding of the nation’s history. The title alone, particularly the juxtaposition between the words “contemporary” and “history”, suggests that there is an entire background to the recent success (2001 to the present) of Romanian cinema. From chapter seven onwards, Nasta continues to deliver close examinations of filmmakers such as veteran director Lucian Pintilie, surveying his career from his beginnings in theatre, his odes to Nikolai Gogol and the formation of absurdism as a narrative device in his films. Alongside this comes an in-depth exploration of each film and post-production reactions including his struggle to hold on to his Romanian identity following his exile to Paris. Nasta likens Pintilie’s farcical post-communist themes to a destroyed Romania, an apocalyptic society. And yet the opposite sentiments are outlined in the following chapter on Nae Caranfil – a filmmaker who portrayed a lighter side of communism, ridiculing the insanity of the past. Nasta examines minimalism through the films of New Romanian Cinema directors Cristi Puiu, Corneliu Porumboiu and Radu Muntean, all of whom have experienced international recognition. The chapter is summarised with the sentence “… everything is implied, nothing is really explained” (156) — an idea that Nasta associates with the aforementioned filmmakers, but can also be applied to Romanian cinema pre-1989. 4 Months, 3 Weeks, 2 Days (2007) director Cristian Mungiu is at the core of the next chapter, his free-cinema style of collecting stories and re-telling people’s memories in real time is compared to the aesthetics employed by the Dardenne brothers. In the final two chapters, Nasta investigates what happened outside of Romania, from transnationalism, financial backing from foreign sources and international casts, to exile and diasporic cinema. Romanian cinema is as complex a topic as Romanian identity. The idea is to keep an open mind and to remember that Eastern Europeans are only human, perhaps standoffish at first, but will always offer generous hospitality to guests no matter their financial circumstances. Nasta’s book is exactly this – an instance where fear of the unknown, of a veiled body of art, becomes an unexpectedly wonderful foundation for an increasingly liberated cinema. Contemporary Romanian Cinema: The History of an Unexpected Miracle is nothing short of a significant contribution to the realm of film theory and critical thought.